In an effort to move the C5 upmarket and appeal to those D-segment saloon buyers who have a desire for more performance with their fuel economy, Citroen has introduced a new, more powerful version of its 2.2-litre diesel engine. Available only with the very top trim level and an automatic gearbox, the new engine defines the new C5 flagship. The move is unusual in the current car market, where manufacturers more commonly introduce lower-powered variants at lower prices to try to introduce more customers to the brand. However, like other mid-level manufacturers Citroen wants to move upmarket and a muscular new diesel option is hoped to give the stylish C5 more prestige in a market dominated by German cars. 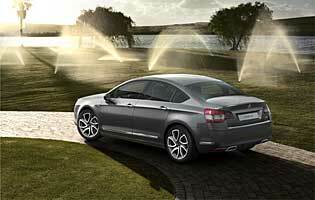 Apart from the engine addition the model in general has changed relatively little from the previous year. It is Citroen's entrant to the company car market, where saloon boots are all but mandatory and diesel engines are by far the biggest sellers. It has the dimensions and capability to make a tempting family car as well, though. Its selling point, given that the Citroen badge can't yet bring the same image as the German brands whose cars rival the C5, is the amount of technology and luxury it provides for the price; not to mention its good looks and the fact that it's still quite a rare and interesting sight unlike its competitors. With a design that prioritises technology, assertive style and long-distance comfort, the C5 has all the ingredients it needs to be a worthy competitor for its target market. It's among the most obviously company car-biased D-segment cars from mid-level manufacturers. There are some shortfalls in its ergonomics but in the main it does a good job as a working vehicle. It will be many years, if ever, before Citroen as a brand can claim to have the same level of appeal to business users as the likes of Audi, BMW, Mercedes, Lexus and Jaguar. But the C5 is a solid package combining substantial dimensions and interior space with impressive technology, attractive looks and a degree of interest that many of its rivals lack. There are good reasons to choose it. The C5 will suffer a little in the second hand market because its reputation and image are not comparable to other cars in the sector. But to counter this big discounts are often available at dealerships or through new car brokers. This is not the most efficient model and represents a noticeable step up in tax from a smaller, less powerful version, and owners shouldn't expect cutting-edge fuel economy either. Here is one of the chief bugbears to be found in the C5. There are a lot of buttons on the centre console, most of them quite small, and as a result some functions are harder to access and use. The static centre trim piece of the steering wheel arrangement will suit some people more than others, because although it means that the buttons are always in the same place, it's more awkward to use them through corners. The front seats are quite heavily curved against your back, which will suit some people more than others and should be tried before buying. Otherwise the chairs are comfortable and would stay that way for long trips. As an older platform than some of its competitors overall refinement is beginning to fall behind, with road noise more obvious to passengers than it could be. There is a great deal of rear legroom though. The C5's alarm serves to monitor forces against the outside of the car as well as intrusions into it. The internal sensors can be deactivated if leaving passengers or pets inside. An immobiliser helps prevent theft without the correct key being present. The remote central locking includes deadlocks and remote window closing, which is useful in the summer. 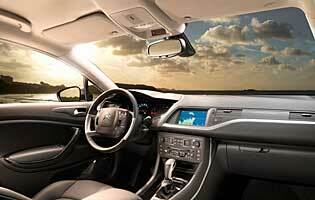 The Exclusive model also has laminated side windows, which helps prevent them shattering. Seven airbags are standard, offering a measure of protection for all occupants, especially the driver who benefits from a knee airbag. Rear side airbags can be added for those wishing for more protection for rear passengers. Citroen has dealt the C5 as much active safety kit as it could, with a full array of active stability and braking assist systems. There is also a 'snow' mode on this and all other automatic variants. There is a switchable 'Sport' mode for the suspension, which has little effect on the overall harshness or firmness when activated, but does add more body control and makes the car feel more settled. The new engine is hugely rich in torque, pulling third and fourth gears like a train using the six-speed automatic gearbox in semi-manual mode if desired. The steering, however, has no perceptible feel and is best at low speed. There are several arguments in the C5's favour with a view to use as a family car. First, its impressive supply of interior space will see three children sat across the rear bench in comfort with room to spare. Two sets of Isofix child seat mounts are installed; one set on each outer rear seat. Secondly its large boot space can hold all manner of child-related luggage, although loading pushchairs is hampered slightly by the saloon-type boot aperture. It is unlikely that the C5 would be on a first-time car buyer's shopping list, and most of the reasons why not are also likely to be hurdles that would be difficult to overcome. Managing the C5's size would be a challenge for anyone with experience of driving only superminis. Size comes with associated insurance risks, running costs and list prices that a new driver would find hard to stomach. As a powerful and relatively large diesel automatic, this is not an ideal first car. On one hand credit should be given to Citroen for competing in a market segment that is no longer natural territory for it. Cheaper models from business buyers' favourite German brands have squeezed mid-level manufacturers' sales, but the C5 still represents a mature alternative choice. 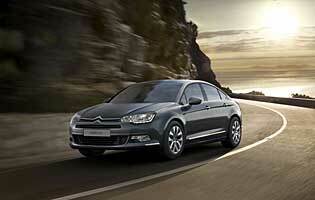 Citroen's brand image is one of quirky style, accomplished engines and generally likeable cars. It's not a brand that will change the world, but buyers know what to expect. As with most mid-size saloons, the C5's front doors are longer than those at the back. People in the front row will have no problem with access, but those in the rear will have to bear the heavily sloping roof line into account when they get in. In the car's favour, the seats are perhaps not as low as some may expect. The saloon boot, the most popular choice for company car drivers in the UK, has a modestly weighted lid and is easy to lift. This range-topping trim and engine combination gets Citroen's 'Connecting Box' technology as standard, which among other things allows music playback via USB input and Bluetooth wireless streaming. Audio controls mounted on the steering wheel are useful, but can sometimes feel like too far a stretch to reach without taking your hand off the wheel. 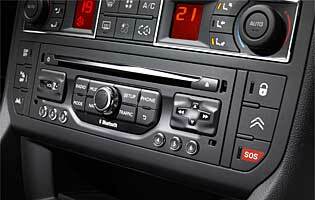 The highly cluttered centre console is also a barrier to ease of use for playing CDs or using the radio. The C5 has a selection of suitably restrained shades for buyers to choose, with the additions to the traditional black, grey, silver and white options being dark blue, beige and brown. These darker hues suit the car best, applying a measure of dignity that suits the car's bulky but svelte lines. The interior follows Citroen design trends of recent years, with a fixed steering wheel centre element and soft-touch materials. It's generally good looking, but could be more driver-focused. Exclusive trim brings with it many amenities, one of which is rear parking sensors. Given the relatively restricted rearward visibility these are very welcome, helping drivers to judge the length of the saloon boot beyond the rear screen. At nearly 4.8 metres long care may need to be taken in some tighter car parks, but the car's fairly average width shouldn't present any parking difficulties. Diesel engine options - 1.6-litre (113bhp); 2.0-litre (158bhp); 2.2-litre (197bhp). Transmission options: five and six-speed manual gearboxes plus six-speed automatic depending on model, plus six-speed EGS6 automated manual gearbox (1.6-litre diesel only). Trim levels: VTR, VTR Techno Pack, VTR+, VTR+ Techno Pack, Exclusive, Exclusive Techno Pack.